A pendulum is a powerful tool that is used to get straightforward, simple answers—often to yes or no questions. 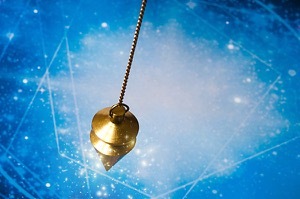 Like other tools, a pendulum helps you receive information that is already known either by your subconscious or the universal collective consciousness. Tools are extras; you do not need tools, you can use your intuition to get the same results. However, using a tool helps set an intention, direct the energy, and teach the mind to go to that highly intuitive place every time you see your pendulum. Unlike tarot, pendulums are useful for more close-ended, yes and no questions. It is also small and easy to bring anywhere. It easily fits into a pocket. Lastly, working with tools is simply more fun. 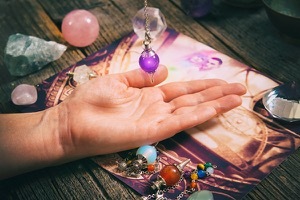 You can get or create your own pendulum out of your favorite crystal or metal, and keep working with it until the pendulum’s and your energy are fine-tuned and in full alignment to receive the information from it. 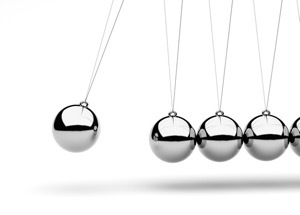 The word pendulum is derived from Latin pendulus, meaning ‘hanging down’ It described a weight that is suspended in the air by a wire or string. It was first called a pendulum in 1643—around the time it was first introduced to Europe, but it was used prior to this, around the world. Its first uses were both scientific and metaphysical. During the Han Dynasty in China, it was used by a scientist to measure earthquakes. Another scientist at the same time used it to try to measure time and the stars. He also used it to predict future events for the Emperor. When it arrived in Europe, its first use was a dowsing tool and as a way to find bad energy spots, including places possessed by negative spirits. It was later picked up by traveling gypsies and used officially as a divination tool for the first time. To hide the object’s actual purpose, they would wear pendulums as necklaces. It has come a long way, and today it is known and openly used in many places around the world. Every metaphysical or gemstone store has a few to choose from. A pendulum weight can be made from a healing crystal, metal, even glass or wood. Wooden pendulums are as common these days as crystal ones, but they are the strongest. Because crystals can absorb energy and therefore influence the reading, choose a wooden pendulum for the clearest messages. Traditionally a pendulum has a pointy end looking down. This is useful when doing a reading on maps or a board. However, round pendulums also exist. Each hangs from a metal chain or another type of string. As you see, making a pendulum is easy—just pick a small pointy crystal or a metal or wooden object and connect it to a string. However, you may also choose to buy one that is professionally made or charge one with a specific intention. When you first get or make a pendulum, you want to clear it from any outsider energies. If someone touched it before you in a store, or whoever came in contact with the crystal you used, may have left some unknown vibrations behind. You can cleanse it by burning sage and move it through the smoke, by washing it in any type of running water, or placing it on a selenite crystal. After the cleansing, you want to put an intention on it—ask it to work with you and to help you receive answers. When first acquiring a pendulum, it helps to carry it around with you for three days to integrate your energy with it. After it is cleansed and after it received your energy and intention, you can start working with it. Asking the pendulum yes or no questions is the most common way to use it. Before asking questions, you need to define what ‘language’ or communication signs the two of you are going to use it. Hold it hanging by one hand with your other palm beneath it. Ask it to show you what its responses mean. After you have asked each write down each movement for each type of answer. Accepted and possible swings are vertical, horizontal, and circular motions counterclockwise and clockwise. After distinguishing the answers, the next time you ask a question, you will know exactly what your pendulum is telling you. Accept the answers your pendulum gives you if it feels right in your heart. If your intuition is telling you otherwise, a different question or tool may need to be used as the situation is more complicated. Asking clear and highly specific and detailed questions works best. You may ask it about your work, love life, family, money, health, travel and any topic about your personal life and interests. A pendulum can also be used for healing. In this case, you want to use it as a dowsing tool to find blocked energies on yourself or whoever you are working on. Finally, a pendulum can be used to balance chakras as it can rid subtle changes of energy.